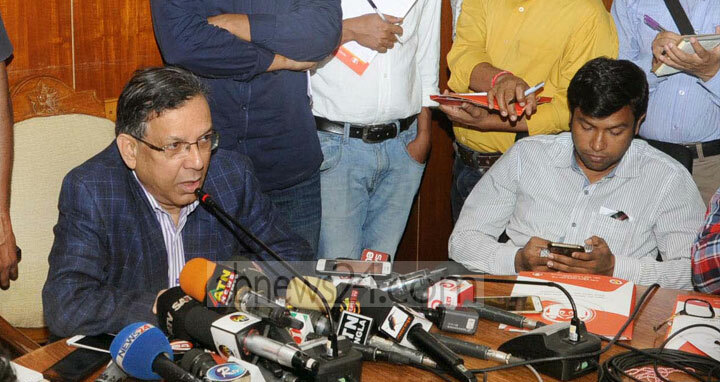 Dhaka, 26 April, Abnews: Law minister Anisul Huq is confident BNP acting chairman Tarique Rahman can be brought back even if his Bangladeshi citizenship is 'void'. The lawyer-turned-ruling-party-politician pointed out that Tarique could be brought back under ‘Mutual Legal Assistance Treaty’ with the United Kingdom. ‘As long as Tarique had passport in his hand, he was a Bangladeshi citizen, but he surrendered his passport to the British government…how could he remain a Bangladeshi citizen?’ questioned the minister while talking to reporters at the secretariat. ‘When a Bangladeshi national stays in the country there is no question and problem over having his passport. But when a Bangladeshi stays abroad, his identity is passport,’ said Anisul, reports the UNB. ‘I’ve heard about the debate over the issue. Fugitive convict Tarique surrendered his passport to the UK government politically…that means Tarique said he didn’t want to remain a Bangladesh citizen and sought political asylum,’ he said. When he left Bangladesh for the UK giving a bond and that means he willingly said he did not want to remain Bangladesh citizen and want political asylum, said Anisul. ‘But we’ve no information whether Tarique granted political asylum or not,’ he said. Tarique Rahman is not a citizen of Bangladesh now that does not mean that he will not get back the citizenship if he wants, the minister added. Responding to another question about broadcasting and publishing Tarique’s news and footages, he urged television channels and media houses to follow the High Court order that banned the broadcast, publication and dissemination of speeches and statements of BNP’s absconding leader Tarique. Asked about the detention and subsequent release of AKM Fahim Mashroor, Chief Executive Officer (CEO) of Bangladesh’s largest job site bdjobs.com over fake Facebook ID, the minister said he will ask law enforcers to carry out an investigation before taking any step.